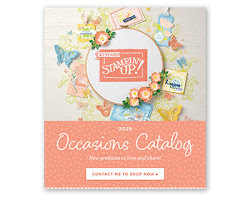 As I promised I am going to share the final 3 projects from the Jan. Stampin' Palooza. We made a box and 3 note cards using the Lots to Love Framelits Dies and the new Narrow Note Cards and Envelopes. Die cut the box and assemble using Tear & Tape. Stamp the Lavender Bouquet with Versa Mark on all 4 pieces of Painted with Love DSP. Emboss with Gold Embossing Powder. Stamp Words on Whisper White and Emboss with Gold Embossing Powder. Die Cut words out of Scalloped Oval Shape. Die Cut Oval Shape next size up out of one if the Basic Black pieces. These new note cards are so cute. Great for using in a gift bag or on a package. Next we made a card using the Heartland Stamp Set with the Mirroring Technique. With Memento Ink stamp image on to the Shimmery White Cardstock, then immediately stamp the image onto the wax paper. Take the wax paper image and flip it over onto the Shimmery White stamped piece. Rub the ink off the wax paper onto the Shimmery piece. Put a dot of the Ink Refills on the piece of wax paper. Take the Aqua Painter (no water just a wet tip) and water color the bottom with Marina Mist and the top with Pear Pizzazz. Stamp phrase and punch out. Punch two more of the labels out of scrap Tranquil Tide and Night of Navy. Attach Ribbon to the Very Vanilla piece. Attach Silver Metallic thread to the 3 punched layers and attach onto the top layer with a glue dot. Place faceted gem. For the last one we worked with the new Brusho. My new favorite stuff to use. I am in love with this stuff and hoping they get more colors. For this card we used the Beautiful Day Stamp Set. Stamp Flower on Water Color paper with Basic Black Archival Ink and emboss with clear embossing powder. Sprinkle Yellow, Gamboge (orange) and Brilliant Red Brusho Crystal onto the stamped Water Color Paper. Spritz with water and watch all the crystal blend together. If you have a section that you want more color, sprinkle more powder. If you have pooling in any areas, you can use a paper towel to soak it up. Stamp words on scrap Whisper White and punch with 1 1/8” Scalloped Circle Punch. Punch 1 3/8” Scalloped Circle out of the center of the Basic Black piece. Attach Crushed Curry Ribbon to back of Scalloped Circles. Attach layers to the base of the card. 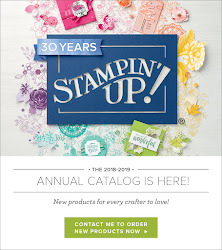 Hope you enjoyed all the projects from the Stampin' Palooza. 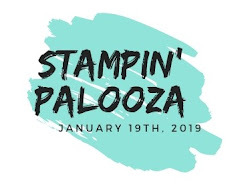 Click here for details on the next Stampin' Palooza. Remember let me know if you need a catalog.